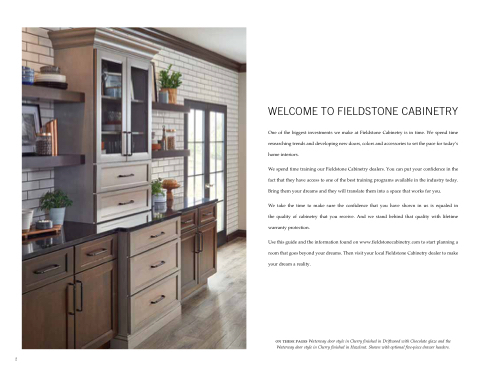 One of the biggest investments we make at Fieldstone Cabinetry is in time. We spend time researching trends and developing new doors, colors and accessories to set the pace for today’s home interiors. We spend time training our Fieldstone Cabinetry dealers. You can put your confidence in the fact that they have access to one of the best training programs available in the industry today. Bring them your dreams and they will translate them into a space that works for you. We take the time to make sure the confidence that you have shown in us is equaled in the quality of cabinetry that you receive. And we stand behind that quality with lifetime warranty protection. Use this guide and the information found on www.fieldstonecabinetry.com to start planning a room that goes beyond your dreams. Then visit your local Fieldstone Cabinetry dealer to make your dream a reality. on these pages Waterway door style in Cherry finished in Driftwood with Chocolate glaze and the Waterway door style in Cherry finished in Hazelnut. Shown with optional five-piece drawer headers.